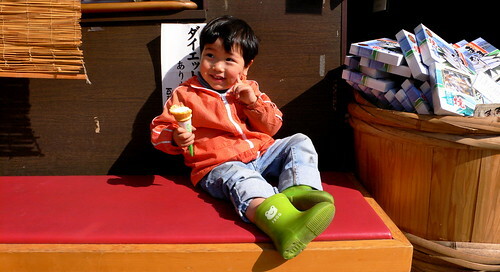 cute kid, eating ice cream. This kid was such a ham! When I asked his mother if I could take a picture of him she not only moved a signboard out of the way, she encouraged him to make cute expressions and touch his finger to his cheek while he smiled. He totally made love to the camera. Then he waved bye-bye and continued with the much more important business of his ice-cream cone.